Weight has always been a struggle for me. Like most people, I tried many different programs. While I did lose weight with the programs I tried, I was never able to KEEP it off. Plus, each time I did this yo-yo dieting, I was damaging my metabolism and causing it to slow down, making it harder the next time I tried to lose diet. In April of 2015, I was at my heaviest of 229 pounds and was wearing a size 20. My clothes were uncomfortably tight and I was wearing bulky sweaters to hide the screaming seams. My climbing weight and growing size was always in the front of my mind. It was causing me so much unhappiness, but I wasn’t sure how to get a handle on it or what program I was going to try next. While on Facebook, I noticed a coworker posting about her weight loss. 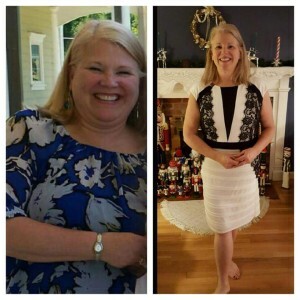 She was dropping pounds and inches every week! When she posted her picture and her weight loss of 25 pounds in 12 weeks, I had to ask her what program she was following. I scheduled a call with Susan and we discussed my past experiences, my struggles and my goals. That phone call changed my LIFE! I began my journey using the TLS Weight Loss Solution on May 27, 2015. To date, I have lost 65.8 pounds and am now wearing a size 10! I feel incredible and have so much more energy. My coworkers are amazed and are constantly noting how much happier I am. I’ve always enjoyed helping others and really strive on making a difference in other people’s lives. Through my own experience with TLS and the training I’ve received, I am now a TLS coach and am helping others use the TLS program to achieve their goals and help them lead a happier, healthier life. If my story sounds like your own, I can help you. 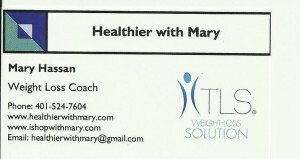 Email me at healthierwithmary@gmail.com. I am so excited about helping people discover this amazing way of life!!! Purchase Your 21 Day Challenge Kit Here. IShopWithMary.com . Purchase your Isotonix Daily Essentials Kit Here at IShopWithMary.com .